In the second of his two-part series on local government relief efforts in rural Bangladesh, Mohammad Tarikul Islam argues that the dispute resolution process is lacking in inclusivity – often backing those with privileged circumstances or with close links to politics and public institutions. He considers the efficacy of local government driven dispute resolution and calls for a fairer arbitration process at the local level. Dispute resolution refers to methods used by trained neutrals to help people to communicate more clearly, negotiate effectively, develop and evaluate solutions, or resolve conflicts. In Bangladesh, local justice is located at the juncture of two of the streams of judicial processes. The first is the rule of law – signifying the supremacy of formal power exercised by the government in accordance with well-established and clearly written rules, regulations, and legal principles through the conventional court system. The second stream of justice is via long-standing local traditions. Traditional dispute resolution and resolution procedures and the intervention of Union Parishad, the lowest tier of the local government bodies in Bangladesh seem to work well for small-scale conflicts. Nevertheless, their efficiency is severely limited in most land ownership-related conflicts. Notwithstanding, Village Courts can help to bridge between Bangladesh’s informal and formal justice institutions in providing a fair arbitration process for confirming justice and human security. Inadequacy and unequal distribution of natural and productive resources as well as growing demographic pressure are among the major reasons for disputes in rural Bangladesh. In Rural Bangladesh dispute resolution with the given local government structure is one of the core needs of rural citizens especially for the poor, who often cannot access formal courts. Conflict is often regarded as a family matter. Similarly, conflict can also be regarded as a community matter – particularly in small communities where social and economic interdependence is strong. Land ownership and level of income represent primary social difference. The main cause of land ownership-related conflicts is the immense pressure on productive land, increased by rapid demographic growth, which characterises rural Bangladesh. Uncontrolled and unreliable selling and purchasing practices and procedures play a significant role in intensifying these conflicts. Sexual harassment often by male individuals and groups is also widespread in rural Bangladesh and goes unpunished. Women and girls in the majority of cases are often not able to take proper action against male-generated provocations or physical approaches. This also seems to be the case in most conflicts involving physical clashes. It appears that in rural Bangladesh, neighbours or passers-by intervene either assisting one party or trying to mitigate the clash. In rural Bangladesh, dispute resolution has been apparent over the years. The Village Courts Act of 2006, which replaced and updated the Village Courts Act of 1976, provides for the establishment of a court in every Union Council. Village Courts are comprised of a panel of five: the Union Council’s chairman; two other Union Council members, one of whom is chosen by each party in the dispute; and then two additional citizens, who are also chosen by the parties respectively. The Courts have jurisdiction over civil disputes valued up to BDT 75,000. They also have jurisdiction over some crimes, including assault and theft, though they do not have the power to fine or imprison; rather they can grant simple injunctions and award compensation up to BDT 75,000. Administratively, the nodal department in charge of Union Councils is the Local Government Division (LGD) within the Ministry of Rural Development and Local Government. Village Courts and Arbitration Councils are also under the supervision of LGD, rather than of the Ministry of Law, Justice, and Parliamentary Affairs. This placement reflects the distinctiveness of the Village Courts and Arbitration Councils from the rest of the judicial system as Village Courts and Arbitration Councils are more local and less legal. 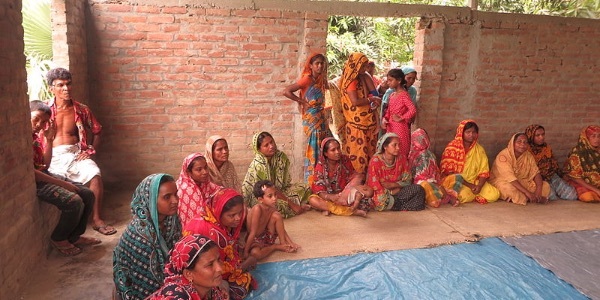 A workshop conducted by NGOs takes place in rural Bangladesh. Photo credit: Afifa Afrin, CC BY-SA 3.0. Administratively, the nodal department in charge of UPs is the Local Government Division (LGD) within the Ministry of Rural Development and Local Government. Village courts and arbitration councils are also under the supervision of LGD, rather than of the Ministry of Law, Justice, and Parliamentary Affairs. This placement reflects the distinctiveness of the village courts and arbitration councils from the rest of the judicial system: Village courts and arbitration councils are more local and less legal. Village courts are largely defunct and UP members have little knowledge of the Village Courts Act. A system of formal village courts located at the UP, which has rarely been effective, has now in most cases disappeared. This leaves the traditional informal Shalish (Shalish, an age-old and conventional method of arbitration in rural Bangladesh enabling sociable dialogues to arrive at a resolution agreeable to all parties involved) as the dominant means of adjudication for small-scale civil and criminal disputes. However, development partners (UNDP and EU) are extending their technical support to the Ministry of Local Government Division for transformation of the local justice system on the basis of equity and inclusion within the context of broader local governance reform in Bangladesh. However, the conflict-management system in Bangladesh is still inefficient, often favouring those parties with better financial means or with close contact to institutions. Poor and marginalised groups are clearly disadvantaged. Nepotism and corruption inevitably hinder smooth conflict resolution processes. Traditional dispute resolution and resolution procedures and the intervention of Union Council seem to work well for small-scale conflicts. Nevertheless, their efficiency is severely limited in most land ownership-related conflicts. Village courts should be propagated among the community ensuring hearings in public on a regular basis. Elaborating rules for refusal when a chairperson of the village court has family or business relations with a party in the dispute is a must. Substantive legal training regarding a core set of fundamental rights which village courts would be required to respect. Transformation of the local justice system is central to the enhancement of equity and inclusion, within the context of broader local governance reform in Bangladesh. The village court can help to bridge between Bangladesh‘s informal and formal justice institutions in providing a fair arbitration process leading to delivering justice and human security. For the sake of fairness in the verdict procedure of the village courts, policy makers should limit the authority of the UP chairperson, and implement the inclusion of refusal rules, requirements of public announcement of the sessions, and the right of parties to exclude a panelist. Insisting that village courts apply the general body of substantive formal law may be unworkable and imprudent. But fairness may be served by specifying a core set of fundamental rights with which village court decisions would be required to comply. A very well structured article. The picture of rural Bangladesh expressed explicitly within this write-up. I think the writer overlooks the barriers of village courts. It may be highly deleterious for poor or politically less powerful people due to disparity or partiality and ignorance. Bad Behavior has blocked 328 access attempts in the last 7 days.